Cars and our clients are our passion. 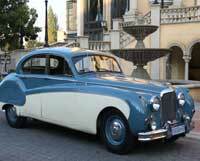 Our exclusive classics for rent is a variety very few companies can match in South Africa. We will beat any written quote and is flexible to suit your needs and special requirements for your special day and occasion. Although we are based in Johannesburg, we can assist and quote nationally. We also have a wide variety of sub-contracted cars in various areas right across South Africa. We have successfully rented cars up into Africa and all over SA. Matric Farewells and normal school dances – be the glamour of the evening and arrive in style. Any photo shoot for any occasion. Movies / Movie props and music videos – our cars have featured in many movies and music videos. Airport transfers for tourists and businessmen – be dropped off or picked up at your meeting or holiday destination. Birthday Lunches / Dinner or breakfasts – spoil a family member or spouse. Be romantic and book a scenic trip to great destinations. We can also add our Viano 10 seater for those extra bridesmaids and grooms with drinks. Our cars comes with a qualified Chauffeur, drinks and food can be catered for your trip, as well as red carpet rentals for your special occasion. We can cater and put a special package together for your specific needs. Talk to us.